Instagram certainly had it’s users in a frenzy and an uproar when it announced that your feed will soon take on the same type of algorithm that is used on Facebook feeds;-instead of images appearing chronologically, posts will now appear in the order based on the feeds you follow more often. Suddenly feeds were drowned in posts that read ”turn on notifications if you still want to see my posts”. 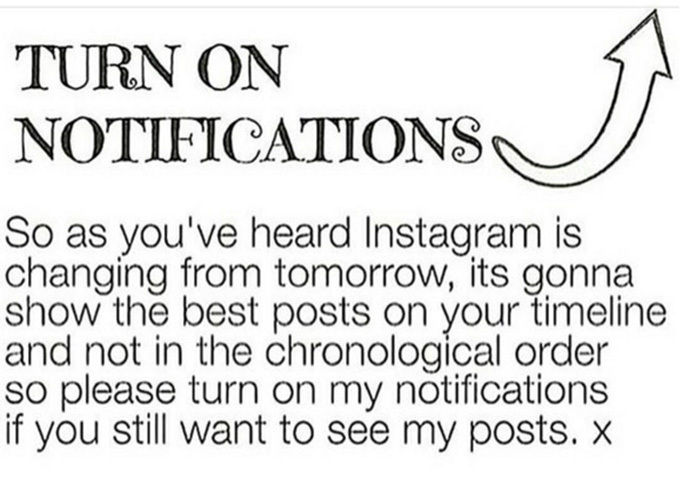 If in fact you tried this, you’ll testify to the unpleasantness of constant notifications and probably immediately turned it off again. In this public-over-reaction Instagram has cautioned everyone that the new algorithm is still in its testing phase and an official rollout won’t happen for a few months to come. If you haven’t been affected by this ‘testing phase’, you’re one of the few lucky ones that can still enjoy Instagram as we grew to know it. It wasn’t long after the new algorithms were introduced, that Instagram also updated their Video Play. Previously this feature was limited to 15 second videos. Now, videos of up to 60seconds can be uploaded. Although the need for longer video capabilities could be heard by all Instagram users, this huge jump was not expected. This is mainly attributed to the rise in video content being consumed on a daily basis, as well as competing social media platforms supporting longer video playback. Reports show that the number of people watching video’s on Instagram increased by as much as 40% over the past 6 months. For the past few years, video content was predicted to becoming the future of social media and online marketing. Consumers are reading less, and watching more, everyday and everywhere, and the amount of video streaming is definitely still on the increase. The upside to this exciting news for social media marketing, will be to create more creative and engaging video content. The downside on the other hand is that it will be very costly in some cases as the demand for fresh, creative and quality content will increase, the production thereof will be just too expensive compared to written/image content. Ultimately your social media strategy and approach will set your content apart. Tapping into your market will give you the results you need. The need for dedicated social media strategies and management will increase together with a shift and increase in advertising as the audience sets the pace of online trends. That’s where we come in.